I was not a very outgoing person and I tended not to mix much with others in the village. It’s not that I disliked people in general; I just was not very good at being social. I did dislike my neighbors though. The wife let her children play outside without any supervision. There was the time I pulled the little boy out of the pond when he’d slipped in. I jumped in and pulled him, gasping and clawing, to the shore. He clung to me, crying and I felt guilty taking him back to his mother. She screamed at him for his carelessness and I could tell he was terrified. He must have been about two. I wished I could have just taken him home with me. Another day, the little boy’s older sister was playing in the road in front of their house, a rider was approaching and I was sure he didn’t see her. The little girl was so preoccupied with her game of stacking sticks and pebbles that she didn’t pay attention. I left my garden where I was working, ran into the road and whisked her out of the way of the horseman. They didn’t deserve those children. I would have taken better care of them if they were mine. They weren’t mine though. I didn’t have children, or even a husband. I had to spend all my nurturing energy on my garden—and I also needed to keep an eagle eye out for the neighbor children. Someone had to. The father of the children next door was a bedraggled sort. He’d come in from the fields in the evenings with sagging shoulders. His wife gave all the attention she didn’t give to her children to him, in the form of yelling and harping. He must have either taken it stoically or completely tuned her out. I never heard his voice raised to her. I also never saw him do anything about their falling down house or broken walkway. I wasn’t sure, but I thought they hit their children too. Sometimes I would see bruises on their upper arms and the children seemed to look at their parents fearfully. One day I noticed to my dismay that the woman was expecting another child. It made me livid. I told myself that it was because she didn’t take care of her children but I knew it was more than that. I was livid because I was jealous. I would have given anything to have a little child of my own. Watching my abusive and undeserving neighbors being blessed with what I could not have was almost more than I could bear. I started to lose sleep over my bitterness. I would lie in my bed and consider how unfair my life was. One night I heard something outside my window. It was a warm night and my shutters were left open so I could enjoy the cool breeze. I listened for a while and then I was sure, there was definitely an intruder. Probably a deer, it sounded too big for a rabbit. I lit a lamp and put on my wrap and walked out to scare it away. I wasn’t sleeping; I might as well protect my garden. I was shocked to see my neighbor in my garden! He seemed equally shocked to see me. We stared at each other wide-eyed in the dim light of my lantern. “I…I…” he stammered. He looked down at his hands, which were clutching handfuls of my prize rapunzel. He hastily dropped it to the ground but I had clearly seen. “You’re stealing from me! ?” I demanded, shrieked really. I already felt venom for these neighbors that had what I could not have, that neglected their children, and now they were stealing from me? He looked completely terrified and that made me even angrier. I didn’t want to be out of control. I didn’t want to be looked at like I was a crazy person. I was the victim here. He was the one in the wrong. At that point, I really lost it. He was stealing my rapunzel, violating my privacy and disturbing my night to placate his pregnant wife!? Without thinking I picked up a nearby hoe. I swung it at him and he dodged it. “I want the baby!” I cried. I didn’t even mean to blurt that out and I think we both were a little surprised. “I want the baby,” I said again, this time quietly. “I will take care of that,” he said. In the village after that, I got strange looks. Some people looked openly afraid of me, some looked at me with disdain and most avoided my gaze altogether. Finally on market day, I cornered old Tavish and asked him. “Everyone is treating me oddly,” I said. “That’s ridiculous,” I said, but I hurried on home. Of course, my neighbor had to think of a reason to give me the baby. Let people think what they would, I was getting a child. A perfect baby. That night I started formulating a plan. I would leave the village. I would go back to the woods where I had been born. My father had been one of the king’s guard. He had been stationed in a tower in the woods and my mother and I had lived there with him. My father had been killed and my mother and I forced to leave so we had come to the village. Sometimes I walked back in the woods and the tower where we had lived was empty now. It seemed it was no longer needed as an outpost. I could make it my home. For the baby and me. I continued to work in my garden. I tended my precious plants, especially the rapunzel. I made sure I had a steady supply for my neighbor. More and more, I just stayed home. People in the village treated me with contempt and suspicion, my pregnant neighbor looked at me with fear; her husband was the only one who seemed glad to see me. I could tell he was relieved to have a place to send another unwanted child. I suspected his wife was relieved as well. Gradually I moved the contents of my cottage to the tower. I created a comfortable home for our future life there. Finally the day arrived and the baby was born. I paced nervously inside my cottage all day as I heard the cries of the mother. After dark, the baby’s father delivered a tiny bundle into my arms. He hardly looked at me, or the baby. He quickly left. I unwrapped my precious gift and beheld the most beautiful sight I’d ever seen. A baby. A perfect baby girl and she was mine to love and care for. I knew I couldn’t waste time. I gathered the last of my belongings and fled to the tower. I didn’t want anyone to know where we had gone so I took a circuitous route and tried to cover my tracks the best I could. Exhausted, I climbed the stairs to our new home. The baby had been sleeping through our journey but now she was awake and ready to be fed. I was prepared with everything I needed to keep my precious one happy. I decided to name her Rapunzel, after the leafy plant that made her mine. She was a happy child with golden hair. I taught her all the songs my mother had taught to me when I had been a child in the same tower. She had a beautiful voice. Occasionally I thought about her actual parents. I felt slight pangs of guilt that they were missing out on this wonderful girl of theirs but I mostly felt immense gratitude that she was mine. She was safe and far away from the neglect and poverty she would have lived under with her parents. I created a vegetable patch in the clearing behind the tower. There wasn’t much sunshine but I was able to grow enough vegetables for our use and I crept into the village and sold the excess to Tavish. He didn’t ask questions and gave me a fair price for the produce. I was happy. No one bothered us, I was back at my childhood home, Rapunzel was growing, thriving even, and she called me mother. One night when I was in the village, selling my vegetables to Tavish, he warned me that there had been questions about me. People wondered what had happened to me. They knew I had taken the baby. They thought I was a witch and they were worried that I would steal more children. I decided it was no longer safe to go to the village. It was only a few hours walk from our tower but I would have to go to a different village, this one a full day’s journey away. I decided if I scrimped and saved, maybe I’d be able to buy us a tiny cottage in the new village. I had to leave Rapunzel for a few days at a time to get my vegetables to market and then to sell them. I was nervous the villagers who knew her parents would discover her. They would immediately recognize the child who had been taken. She bore a strong resemblance to her sister and had the same golden hair as her mother and brother. There was no way to lock the door so I finally came up with the idea of boarding the door completely shut. Rapunzel had long hair and if she hung it out the tower window, I’d be able to climb up and down it like a rope. It wasn’t a permanent solution, but would have to do until I could afford a rope. Rapunzel complained bitterly about this arrangement but she was a headstrong and adventurous girl of 15 and I couldn't risk her venturing into the village and giving away our location. I promised her it was temporary. I was doing my best to earn money. Week after week all late summer, I took my vegetables into town. I was collecting a good store of coins. I never bought us any extra treats anymore like I had in the past. When I approached the tower, I’d call up, “Rapunzel, let down your hair!” and her long rope-like braid would descend. She’d first wrap it around a post so it wouldn’t pull and I’d clamor up. Rapunzel eyed the growing supply of coins and wondered when I was going to buy the rope. I felt errant in my mothering. I’d been so excited about being able to buy a cottage, I’d forgotten about a rope. “I’ll get one next time I go to the village,” I told her. True to my word, I bought a thick rope the next time I was in the village. It cost me several coins but it was worth it. I wanted to keep my darling girl happy. I was walking back toward our tower, after being away a few days when I heard talking and laughing. It was coming from inside and I heard the distinct sound of a male voice. I froze and hid behind some bushes. Fear clutched me. Who could it be? How did he get inside the tower? Was Rapunzel safe? Then I realized that the other voice I heard, was Rapunzel’s, happy and lilting. How dare she? It wasn’t safe to let anyone know about our tower home, and she knew it! “My mother said she’s bringing home a rope next time,” Rapunzel murmured as she nuzzled against his chest. “Then we can escape!” he said. He slid down the cord that was her braid. “Farewell, my love!” he called up to her. As he climbed on his horse, I realized he was the prince! “I will come every day and see if it’s safe,” he said. “I’ll leave my shawl out the window if it is!” she promised. With that, he walked off into the woods, humming. Before I had been paralyzed with fear, now it was pure rage that kept me rooted to my spot. That stupid girl! How could she have betrayed me this way? I had given her everything I could and all the love I had. Everything I had done for the past 15 years had been for her! After enough time had passed that I knew Rapunzel wouldn’t suspect me, I went to the base of the tower and called up to her, “Rapunzel, let down your hair.” I was determined to give her the benefit of the doubt; maybe she’d tell me about the prince on her own. Well, she didn’t. I asked her if anything interesting had happened in my absence. “No,” she said innocently. “No,” she said, clearly lying. This time my rage did not paralyze me but instead it propelled me into action. In one quick motion, I grabbed a nearby knife, one I used for pruning my plants, and hacked off her braid. Rapunzel and I both dissolved into tears after I saw what I had done. My temper had gotten the best of me again. “I’m sorry!” she wailed. I wrapped my arms around her and told her I was sorry too. I was sorry that I had kept her hidden away. My fears had made a prisoner out of her. I very nearly had the money saved to buy us a little cottage in the distant village. She wouldn’t have to hide there and we could live in peace. I promised her things would get better. I told her that she had to be honest with me though. We had to trust each other. The growing season was at an end so I didn’t have a reason to go away again. I had everything we needed to make it through a winter, cozy in our tower. In the spring, we could make our way to the village and live there. As the months passed, it became evident that Rapunzel was expecting a child. The anger that had caused me to react so drastically as to cut her hair, threatened to consume me again. I blamed myself for not teaching her better and I blamed the prince too. I decided to confront him. I wouldn’t tell Rapunzel about it and I disguised myself in a veil because I was going to our old village and didn’t want to be recognized even though it was 15 years later and perhaps no one was looking for us anyway. I traded a gold ring that had been my mother’s to Tavish for a basket filled with eggs. He recognized me of course and wanted to gossip but I didn’t have time. I needed to get into the castle and I needed the basket in order to play the part of a servant delivering eggs. I slipped inside the castle gates, allowed in by two sleepy looking men who were chatting lazily and not alert in their duties. Once inside I slipped through the passageways and ducked into corners every time I saw someone coming. I had never been in the castle but it was not difficult to figure out which way to the royal family. I heard voices and hid behind a parapet. Peeking around the side briefly, I realized it was the prince. He was with a young lady and she was giggling. Then they were kissing and I felt a mixture of nausea and barely contained wrath to be witness to such behavior. My sweet Rapunzel was carrying his child and there he was acting like that. I stole one more glance and realized it was a servant girl he was kissing. Finally I saw my chance and crept back down the hall. I turned into a passageway that led to the kitchen. I heard servants there mentioning the prince so I slowed my pace to listen. They were talking about his marriage last spring to a princess from a neighboring kingdom! I was so stunned I pressed my back against the wall and had to stay that way before I could gather my wits about me enough to flee. He was married!? I took a long walk in the woods before I was calmed down enough to return to our tower. I had hoped to speak to the prince; to convince him to marry Rapunzel. I could see now there was no hope for any sort of marriage or help from the prince. My only consolation was that I’d manage to hang onto the basket of eggs through it all. We could use them. Over that long winter we stayed cozy in our tower. I had saved enough root vegetables and squashes to keep us fed. Rapunzel’s beautiful voice cheered us through the evenings while she sang her songs and I would brush her short hair and tell her tales about the lovely cottage I was going to buy for us in the spring. We decided that we’d tell people Rapunzel’s husband had died. Rapunzel never mentioned him but I could tell she still thought about the prince but I didn’t tell her the truth about him. I didn’t know how. As spring arrived, she and I both seemed to have an ear alert for any visitors to our wood. I kept busy cleaning and deciding what to take to the village and packing our belongings and Rapunzel sewed tiny clothes and knit little stockings and hats for her baby. I had already taken a few trips to our new cottage. 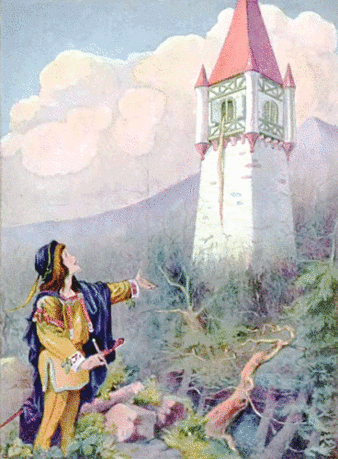 Each time I left her, I cautioned Rapunzel not to let anyone visit her. She’d eye the strong rope we used for a ladder and also the coiled braid that sat in the corner—somehow neither of us had been able to part with it—but she’d tell me she’d obey. One morning, I was making preparations for my last journey into the village before we moved there permanently. We heard a rider approach. He was whistling a tune. Rapunzel and I looked at each other and we both knew without saying a word, it was him. I motioned for Rapunzel to stay seated. Her eyes bulged when she saw me pick up her braid and loop it into the iron ring that held the rope. I tied a fast knot and lowered the braid over the edge of the window. I held my finger to my lips to keep Rapunzel from saying a word. She looked nervous and excited and that broke my heart. I should have told her what the prince was really like long ago. I shouldn’t have let her continue to hope. He quickly made his way up the braid and his expectant smile quickly evaporated into confusion when he saw me at the top of the window. I didn’t want him to see her but Rapunzel stepped aside so she was in view. Let him know what he had done, I decided. I was curious to see what he would do. I explained my earlier journey to the castle. I told her what I’d found out about the prince. Rapunzel dissolved in tears and seeing her heartbreak made me numb to the cries of the prince outside our tower. I put my arms around my Rapunzel and let her cry. The next morning, the prince and his horse were gone. We settled into our little cottage in the village. I planted a beautiful garden and we lived in comfort. When the time came for Rapunzel to have her baby, there were twins. A boy and a girl. I could not have been happier with them. My arms had always longed to be filled with babies. I could tell that Rapunzel was sad. She would gaze out the window at the horizon. I wondered if she was thinking of the prince. Rapunzel chose Jack and Rose as the names for her babies. Jack looked like Rapunzel’s brother, who I had known long ago in the old village. I gradually told Rapunzel the story of how she came to be mine. Her innocence was long lost. We talked about planning a trip to go visit our old village someday, perhaps when the twins were older. She wanted to meet her family. My old fears and resentments had faded. Let them think I was a witch. I had better things to think about now, like the happiness and well being of Rapunzel and her beloved children. When Jack and Rose were five years old, we decided to take the journey to the village where Rapunzel had been born. The twins were old enough that they could walk most of the way but small enough that we could carry them a ways if they got too tired. Even so, we went slowly, much slower than my trips alone had been. We had to camp for the night. Rapunzel and I nestled the children into warm blankets and then Rapunzel began to sing to them. Her lovely voice carried out into the early evening air. Even after the twins were asleep, she continued to sing. I looked over at Rapunzel and couldn’t read her expression. She was standing up straight and tall but she looked like the slightest breeze would knock her over. “It is I,” she said. The prince gasped. “Help me down,” he commanded his servant. The prince was assisted from his saddle, and with his hand on the shoulder of his servant, he approached Rapunzel. The prince had his other hand extended in front of him and when he got close enough, Rapunzel reached her hand out to him. The prince held her hand in both of his and moved his fingers over the top of Rapunzel’s. I knew he felt the rough skin and calluses of a woman who worked to support herself. Rapunzel’s hands were like my own, rough from digging in the soil and from the harsh lye soap we used. Rapunzel’s face gave little away but I could tell she was uncomfortable. Perhaps she was remembering how soft and ladylike her hands had been the last time she’d seen the prince, when she was still just a songbird trapped in a tower. “You were married,” Rapunzel said simply. “You won’t forgive me?” the prince looked shocked. “There’s nothing to forgive,” Rapunzel said with a sigh. Clearly he wasn’t used to being opposed. “You would deny your prince?” he said haughtily, rising to his feet. “You were never my prince,” Rapunzel said and she turned on her heel and walked away from him, toward her sleeping children. The prince of course, couldn’t follow. His servant stood looking confused as to how to proceed until the prince finally had the man assist him back onto his horse. Rapunzel was shaking ever so slightly when I returned to her.